Horizontal Drilling | Texland Petroleum, L.P. The biggest change in the last decade has been the introduction of horizontal drilling. Texland can now drill one horizontal well, complete several frac jobs from one surface location, and have the same or better results than 3-6 vertical wells would have in the same area. The size of each frac job is exactly the same as a vertical well, but the process is repeated in 8-10 different locations within the wellbore. When leases permit horizontal drilling, we can reduce the amount of surface acreage used for pad sites because we can do from one location what would historically require up to six pad sites. 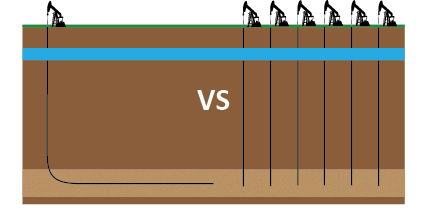 We can also reduce the number of penetrations through groundwater reservoirs.